Products may be linked to one or more tax classes, allowing different tax rates, and combinations of tax rates, for different types of products, and tax rates may be applied to customers who reside in specific states or zones. For certain countries, the store may also be setup to display taxes included in the product pricing (VAT). Optionally, currency exchange rates may be updated automatically, on a daily basis, to the current market rates. Having a beautiful storefront that matches your homepage builds customer confidence and is a mark of professionalism. In eShox, uses have a choice of several pre-installed themes or can select from a large number of professional themes to find one that suits their needs. Most themes can be extensively customized by selecting from a long list of options like banner image, banner size, sidebar position etc. Your eShox store includes the ability to create custom web pages, which double as a links, so your website navigation can easily be replicated in the store. Created with specialty products in mind, eShox is capable of allowing customers to build their own custom products and to see the result before making a purchase. 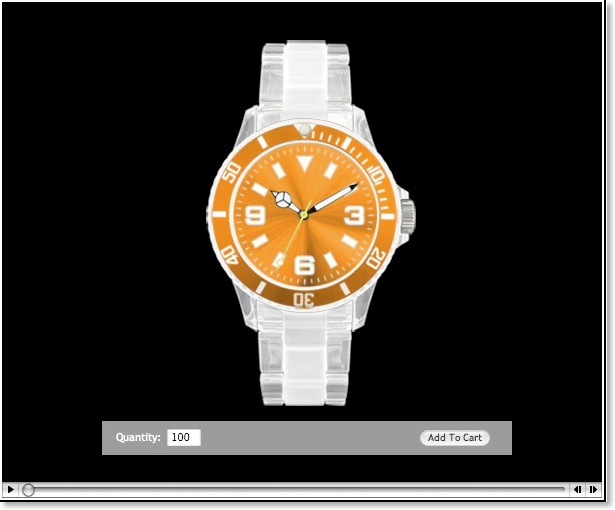 The product "configurator" works by combining layers of transparent images to create a complete image. Each layer is linked to a pull-down menu which will trigger a different image for each menu item. The eShox storefront is maintained via a feature-rich, easy to use, multi-user administration interface. The admin is a very intuitive window-based interface that provides functionality similar to both Windows XP and Mac OS X. Each feature is documented within the interface with descriptive text. Certain parts of the interface include balloon help for more detailed help when the cursor hovers over them. Permissions are user-specific, from basic access for manufacturers (to view orders containing their products), to specific permissions for every section of the web-based admin. Different menus are displayed depending on who is logged-in and what they should have access to. During checkout, customers are presented with a choice of payment methods accepted by the store. One or more types of payment may be enabled simultaneously, including: credit card, PayPal, check, money order, and cash. PayPal payments made using eShox offer increased security by making a connection back to the store for verification. * Payment gateways above are only available with eShox Deluxe hosting. Standard eShox hosting provides only PayPal for payment processing for security reasons. Customers are presented with choices of real-time and fixed-price shipping methods at checkout. Real-time methods contact the shipping carrier's server to obtain a dynamic rate quote. Fixed price methods allow the store to provide static rates based on the total number of items, the price, the weight or the destination of the package. Insurance and handling fees may also be setup and included in the shipping rates. The shipping methods are provided using a modular system which allows the administrator to setup the methods they wish to offer. Included with eShox are modules for all the major carriers: UPS, USPS, FedEx and DHL (USA). Each module utilizes the respective carrier's API for rate quotes (and for UPS, FedEx and DHL, the store's account-specific rates may be provided). Once packages have been shipped, the tracking number(s) may be attached to orders so that customers may return to the store at any time to track their packages. eShox connects directly to UPS, USPS, FedEx and DHL servers at checkout for accurate shipping quotes. Browse the sales performance for your best performers using detailed, real-time graphs and statistics. A multi-dimensional interface allows you to set filters and group records to find the exact numbers you are looking for. You can filter records by time, category, manufacturer and/or affiliate; and group records by affiliate, customer, category, product, manufacturer, day, month, week, year, country, region or zone. eShox includes a modular import/export system that allows virtually any format file to be imported/exported. Formats such as: FileMaker Pro XML; Microsoft Excel²; Address Book vCard²; and Tab- and Comma-Delimited Text, Delicious Library¹, Froogle Product Feed² and iTunes Song List¹ formats are all supported, allowing data from virtually any application to be imported. 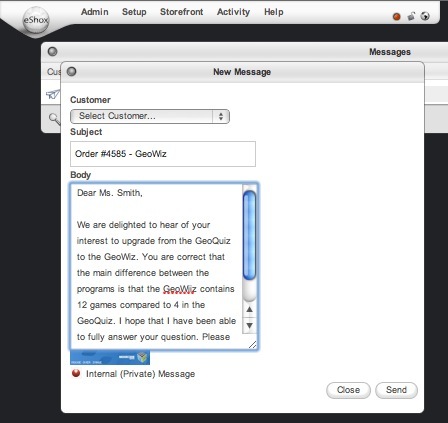 Send messages to customers while they shop, receive messages while you administrate. eShox has been specifically designed to make it easy to sell digital content - whether music, documents, images or software. Add your band's music, directly from iTunes, and customers can play sample MP3's using a flash player. Take advantage of eShox's built-in license code generator to automatically create dated licenses for any digital content. © 2003-10, Secure.CC Ltd. All rights reserved. eShox is a registered trademark of Secure.CC Lrd.